WinTopMost disables close buttons for selected applications Word, Excel or for example when a clean logout is required leaving a Telnet window. The site license lets you install it in as many computers as needed in a company site for disable close control or topmost features. 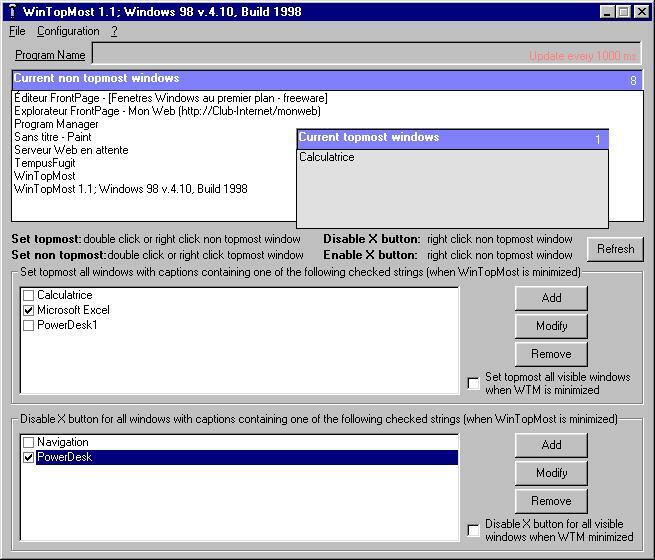 Automatically put topmost any window or disable its X close windows button on Windows 95/98/NT 4.0/Windows 2000/ Windows XP programs. Can manage topmost windows using captions containing specific strings. WinTopMost intercepts windows captions when programs are running on your desktop, can intercept several strings and set topmost different windows programs. Allows to disable automatically X close windows buttons using specific strings in their caption inclidung exact match string. You can use WinTopMost to ensure that the users log out correctly for example for telnet, not just close the application. Windows administrators may also use it in command-line mode for batch processing.